Or, are you holding onto the reins too hard? Does your horse brace against one of the reins? Or, are you holding onto one of the reins too hard? Does your horse not move between your hand and leg? Or, do you not ride your horse between your hand and leg? EC Hand is a product which helps the rider train her/himself to use a correct hand in a clear and easy way when riding. So far there is no other product on the market that can technically adjust the riders hand and provide help the same way that EC Hand does. 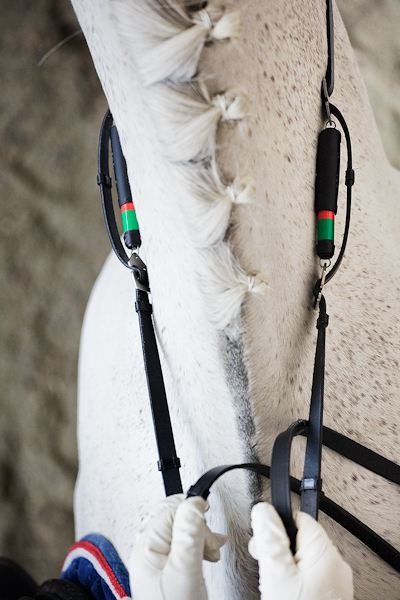 The product is easy to attach to the reins on both sides of the horse. 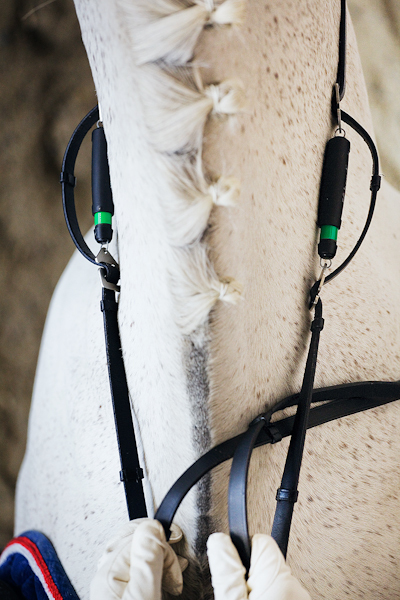 While riding, the EC Hand device will show the rider how hard or soft she is holding the reins; and if the pressure is evenly divided between the left and right reins. EC Hand will also tell you if your hands have the appropriate "give", if it is enough and quick enough. EC Hand is attached to each rein and uses color codes to display the pressure put on each rein. For example, if you ride with correct support, the green area will display. If you ride with too much pressure, the red area will display. Also, if you don't give the appropriate release or pull on the reins, the red area will show until the pressure is corrected. If you ride with too little rein support, no color will be displayed. Why is it important to ride with a well coordinated and correct hand? 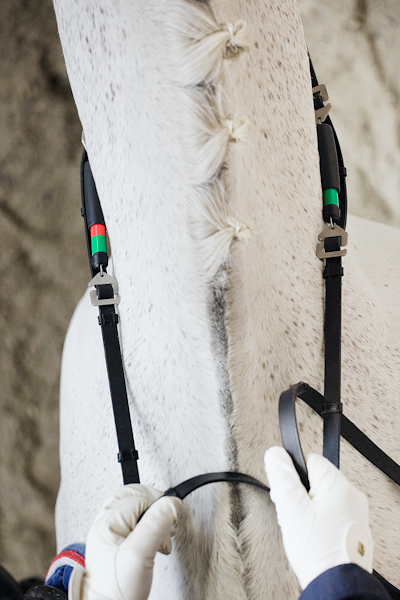 EC Hand allows you to improve the horse's ability to be even-sided and straight. This means that the horse is just as soft on both sides, has the same level of muscles on both sides and the horse's front and hind legs are tracking along the same line with proper bend through the body. For that you need to be able to ride with equal pressure in both reins. If you are not precise with this, the horse progressively becomes crooked which the rider experiences as if the horse is stiffer on one side or that the horse is pulling more in one rein. In order to achieve success in training and competition, it is important that you straighten your horse. A horse that is out of balance doesn't use the hind legs correctly and can therefore not perform at his highest level. An evenly trained horse provides the foundation to success and has a better change to remain healthy. Why don't all riders ride with a correct hand? And what is the difference between the better rider who is born with the "feel" and the "average" rider? The rider is usually not aware that he/she is holding the reins unevenly. Instead, the rider feels that the horse is bracing and that he is uneven. The challenge is that the rider seldom has anything to compare to and measure against. With EC Hand it is easy to see how you should hold the reins. The spring is well adjusted and tested of Pro EC's experienced product developers. Have you ever wondered: How hard do others hold the reins and what is appropriate? To ride a horse correctly, it is important that you neither hold the reins too hard or too soft. The rider should use the energy coming from the horse's hind legs through the horse's back. If you do not have enough rein pressure, you can not take advantage of this power and the horse will not be through. If you hold the reins too hard the horse will be front heavy and will be unable to transfer weight onto the hind legs. At times, it will be appropriate to ride on red for example in a moment of adjustment. However, when the horse is performing right, the rider needs to ride on green again. Otherwise you will teach the horse to accept rein pressure that is too heavy. This is what we call correct give with the hand. You will soon see your hands improve and also get further understanding for cause and effect of your riding by reading the horse's response when you are using EC Hand. You will also better understand your trainer's instructions. Use EC Hand regularly and improve your riding in a short time frame. EC Hand will not solve all riding problems, but you will advance quicker if you are using it. EC Hand directly shows the truth regarding how well you communicate with your horse though the reins.